Pretty good match. Yoshinobu rushed Tiger Mask and attacked him on the way to the ring. The match started while the two were brawling outside. Tiger Mask fought valiantly and kicked out of a few believable finishes, but the number of Suzuki Gun were too much. TAKA made his presence felt throughout the match, and Taichi came to the ring during the match to provide his own interference. After the match, Suzuki Gun attacks Tiger Mask and Yoshinobu pulls his mask off. El Desperado vs Volador Jr.
Good match. They started quickly with some lucha-inspired exchanges, but Desperado didn’t take long to take it to the crowd. Desperado threw Volador into about five rows of chairs then set himself up for a round of cheating. Volador used a chair and the ring bell hammer to cheat as much as he possibly could. It worked for a while, but Volador managed to turn the momentum to his favor late in the match. The finish here wasn’t pretty, but it worked. Pretty good match. Taguchi did some of his usual comedy bits, and BUSHI wrestled a pretty straightforward match. It was good, but I don’t think there was anything about it that really stood out. I think they’ve both had better and more memorable matches so far in the tournament. Very good match. Both guys needed a win to realistically stay competitive in the tournament and I wasn’t sure who to pull for. The match ended up being quite competitive. 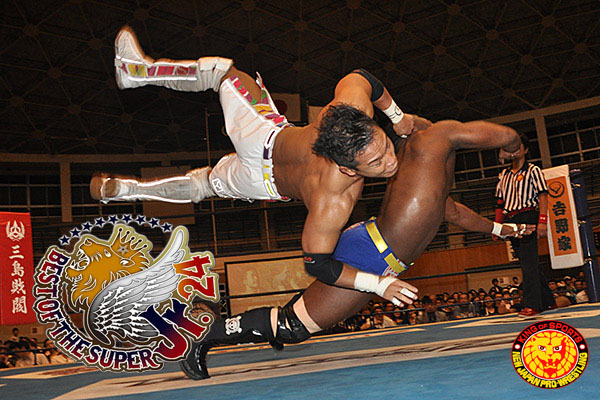 KUSHIDA kept going for arm submissions, but ACH seemed to have a lot of counters. There were some very strong sequences in this one, and even though I’m kind of sad that one guy lost, I’m happy that the other won. This wasn’t the best night of the tournament so far, but it had some solid matches. Easily the best of the night. I almost wanted this to go to a draw so both guys could take a point.